Allied Home Inspections LLC can test your home for radon gas in NY or Connecticut (CT). We can normally schedule radon testing in your home within a day or two. Results are usually available in a few days, please call for pricing. Click here for more information on radon and radon testing in CT and NY. All of our radon in air testing utilizes the EPA approved dual cannister method. This provides not one but two air samples for radon gas and is not subject to power outages or spikes in voltage. Most importantly, the testing apparatus is "zeroed" or checked for accuracy by a state certified and licensed lab technician before each use, assuring you of the most accurate results possible. Radon is a cancer-causing, radioactive gas. You cannot see, smell, or taste radon. But it still may be a problem in your home. When you breathe air containing radon, you increase your risk of getting lung cancer. In fact, the Surgeon General of the United States has warned that radon is the second leading cause of lung cancer in the United States today. If you smoke and your home has high radon levels, your risk of lung cancer is especially high. 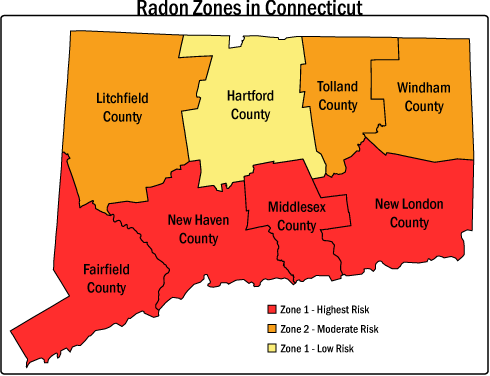 Radon has been found in homes all over the United States, including Connecticut and NY. It comes from the natural breakdown of uranium in soil, rock and water and gets into the air you breathe. Radon typically moves up through the ground to the air above and into your home through cracks and other holes in the foundation. The gas can also enter your home through well water. Your home can trap radon inside. Any home can have a radon problem. This means new and old homes, well-sealed and drafty homes, and homes with or without basements. In fact, you and your family are most likely to get your greatest radiation exposure at home. That is where you spend most of your time. Elevated levels of radon gas have been found in all states. The EPA recommends that you take action to reduce your home's indoor radon levels if your radon test result is 4 pCi/L or higher. It is better to correct a radon problem before placing your home on the market because then you have more time to address a radon problem. Call for more information on radon gas. We can test for radon in air and / or radon in water in most parts of Connecticut and NY including Fairfield, New Haven, Litchfield, Westchester, and Putnam Counties.